Stephanie is a wife and mother of three college students. As a biologist (a graduate of Ohio Northern), she has worked in cancer research and histology. For the last twenty years, she has taught her children, as well as other home-school students, biology, chemistry, and anatomy. Interwoven within those years, she has written and taught Bible studies (including spiritual warfare and the books of Revelation, Daniel, and Ephesians) to college students and adults. In her spare time, she enjoys studying the original languages of the Bible through word studies, commentaries, and classes. 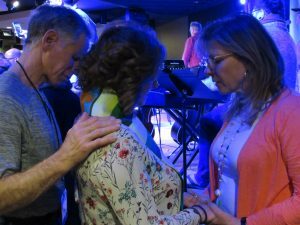 She recently became licensed in the ministry of the Gospel through Messenger Fellowship and will be ordained next spring. Stephanie is currently working on a Bible study on the book of Hebrews. Stephanie was ordained on March 25th, 2019. Congratulations Stephanie! Cecil is a husband and pastor of Love Divine Church in Cleveland, Ohio. He has been a minister for over twelve years. Cecil has a BA from Ursuline College in Business Management, an MBA from Myers University, and a BA in Theology from the American Bible College, located in Memphis, Tennessee.